I am no souvenir junkie to be honest. When I travel I most often bring back magnets as travel souvenirs, and when friends and family travel, I always ask them to send me a postcard. There’s something about opening the postbox and finding a postcard! I dream of having a wall full of postcards one day. A new kind of souvenir that I am beginning to really enjoy are ‘food souvenirs’. Though perishable, food is a great way to share memories of one’s travels with loved ones and colleagues back home. My husband came back from a trip to Brussels and Netherlands, and brought back lots of Stroopwafels – a mouth watering Dutch street snack. 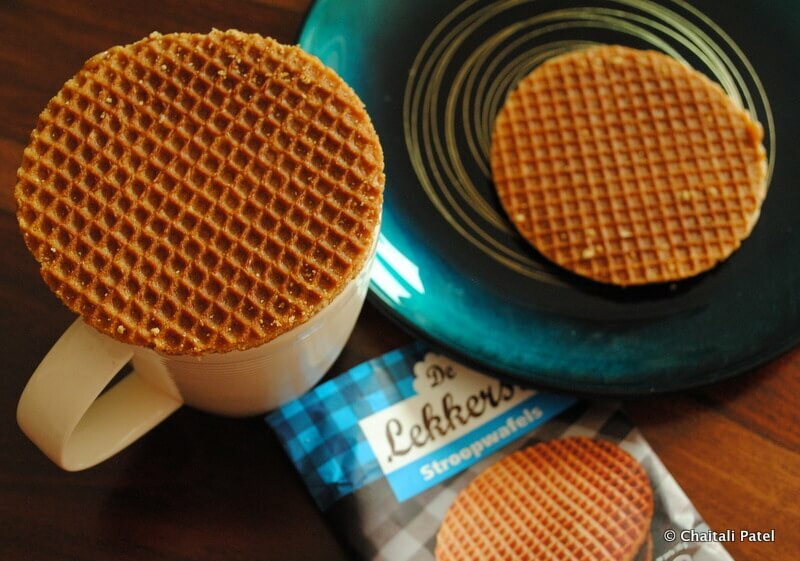 A Stroopwafel is nothing but two wafer thin waffle discs sanwiched with a gooey caramel syrup in the middle. They are said to have originated in the Dutch city of Gouda (If you are wondering why that rings a familiar bell, its because Gouda cheese – famous the world over is named after the same city) way back in 1784. A local baker is believed to have made these waffles from leftover breadcrumbs sweetened with syrup. Little did the baker imagine that his innovation would go on to become a national favorite. By the 19th century Gouda alone had about a 100 Stroopwafel bakers. Sold on the streets these thin crisp waffles are now seen in easy to carry back pouches across most supermarkets. 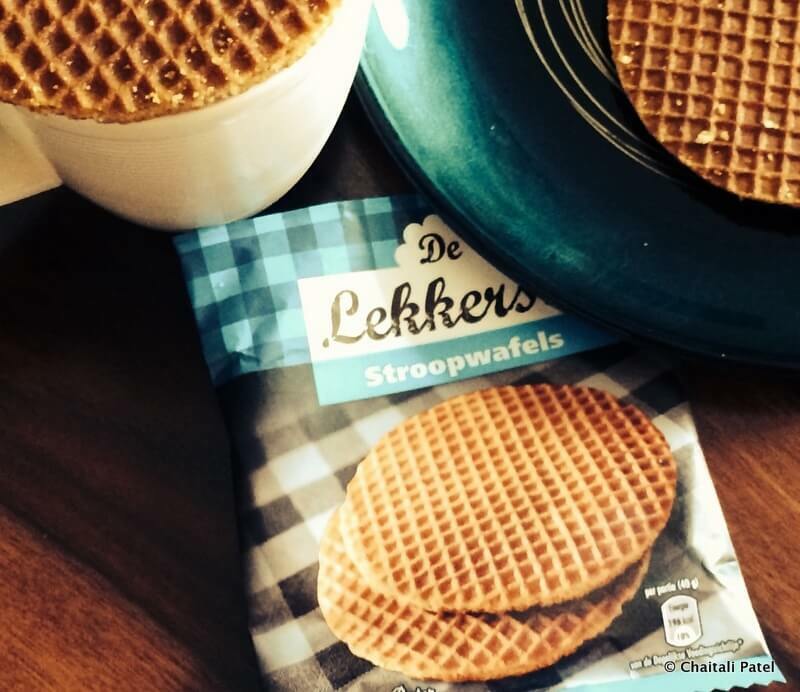 We were first introduced to Stroopwafels by my husband’s colleague from the Netherlands a long, long time back. We devoured our lovely gift and left it at that. When my husband visited the Netherlands many years after, he wanted to bring us back those very waffles. Luckily, he managed to find locals who understood his description and we got our consignment of delicious waffles. You can eat these waffles as is or eat them the right way – which is to place them on the top of a mug with your favorite hot beverage. The diameter of the mug should not be larger than the waffle or otherwise it will fall into it. Ideally it needs to rest on top of the rim of the mug. The beverage has to be hot, as the steam and heat from it will moisten and soften one side of the waffle. 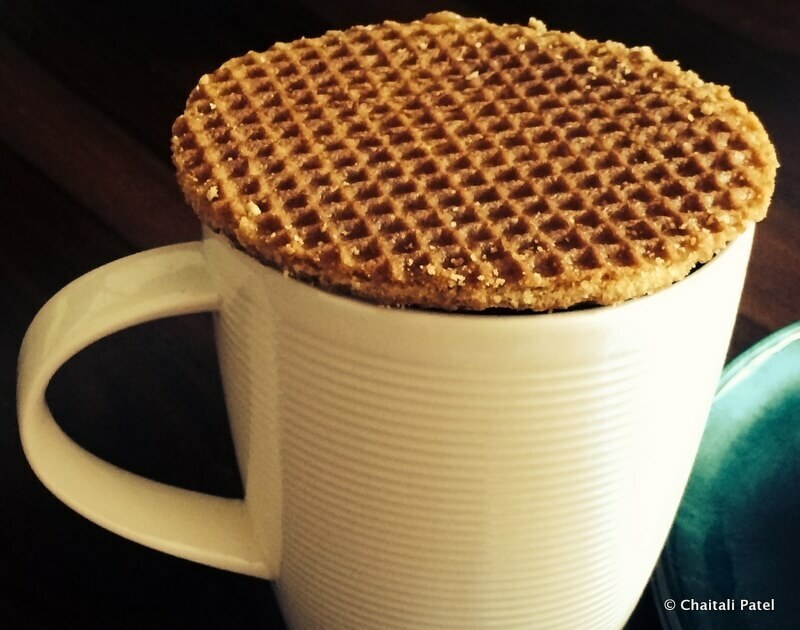 Once you find the right mug, fill it and place the waffle, give it at least 3 to 5 minutes to soften. I know that seems long, but trust me the wait is totally worth it. Food is such an integral part of travel and every country, every city / town has something unique to offer. Next time you travel bring back local delicacies (obviously those that will last the journey) and share them with family and friends. Relive your memories over some goodies. This is the first of a series on ‘food souvenirs’ on this blog. Every place I go too, I am going to bring back food souvenirs and share them with my family and on this blog, with all of you. Do you have any special food souvenirs that you have brought back from your travels? Waiting to hear about your experiences. Glad you enjoyed reading this post. Thanks for dropping by. 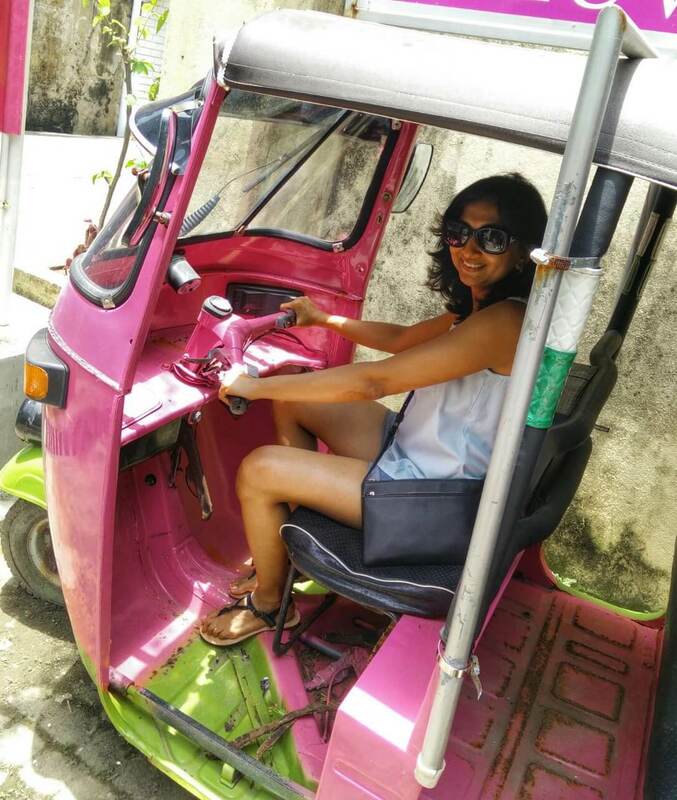 Thanks Indrani… I am really excited about this series, as there's a fun element attached to it. 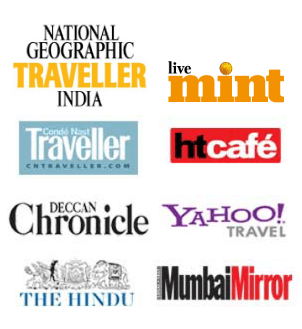 I am based in Bombay. Where do you live? We can meet up and yes I am very happy to have a guest post on a food souvenir from one of your travels either in India or abroad.